April: Yingjie (Tim) Ling is selected as a 2019—2021 Laidlaw Scholar. Congratulations, Tim! April: Mr. Kevin Schult joins the group. Welcome, Kevin! March: Omeir Khan is selected as a 2019 Summer Scholar. Congratulations, Omeir! March: Aidan Fike is named a 2019—2020 Beckman Scholar. Congratulations, Aidan! March: Our review “Using synthetic peptides and recombinant collagen to understand DDR—collagen interactions,” is published in Biochim. Biophys. Acta Mol. Cell Res. December: Our paper “Beta-branched amino acids stabilize specific conformations of cyclic hexapeptides” with the Kritzer Lab at Tufts Chemistry is published in Biophys. J.
November: Mr. Jovan Damjanovic joins the group. Welcome, Jovan! November: Our paper “Enzymatic phosphorylation of Ser in a type I collagen peptide” with the Brodsky Lab is published in Biophys. J.
November: Francini Fonseca passes the Research Topic Exam. Congratulations, Francini! August: Our paper “Destabilized adaptive influenza variants critical for innate immune system escape are potentiated by host chaperones” with the Shoulders Lab at MIT Chemistry is published PLOS Biology. August: Our paper “Enhanced ER proteostasis and temperature differentially impact the mutational tolerance of influenza hemagglutinin” with the Shoulders Lab at MIT Chemistry is published in eLife. May: Dr. He (Agnes) Huang joins the group. Welcome, Agnes! May: YSL is awarded tenure and promotion to Associate Professor! May: Our paper “Collagen Gly missense mutations: Effect of residue identity on collagen structure and integrin binding” with the Brodsky Lab at Tufts Biomedical Engineering is published in J. Struct. Biol. May: Our paper “Effects of flexibility of the α2 chain of type I collagen on collagenase cleavage” with the Brodsky Lab at Tufts Biomedical Engineering is published in J. Struct. Biol. April: Aidan Fike, Omeir Khan, and Tim Ling join the group. Welcome! March: Eric Chen is selected as a 2018 Summer Scholar. Congratulations, Eric! March: Our paper “Light-responsive bicyclic peptides” with the Derda Lab in the Department of Chemistry and the Alberta Glycomics Centre at the University of Alberta is published in Org. Biomol. Chem. March: Our paper “Designing well-structured cyclic pentapeptides based on sequence—structure relationships” with the Kritzer Lab at Tufts Chemistry is published in J. Phys. Chem. B.
February: Our review “Understanding and designing head-to-tail cyclic peptides” is published in Biopolymers. November: Ms. Francini Fonseca joins the group. Welcome, Francini! November: Sean McHugh defends his PhD thesis. Congratulations, Sean! November: Our paper “Structural basis for the antiarrhythmic blockade of potassium channel with a small molecule” with the Noujaim Lab in the Department of Molecular Pharmacology and Physiology at the University of South Florida is published in FASEB J.
October: Our paper “Consequences of depsipeptide substitution on the ClpP activation activity of antibacterial acyldepsipeptides” with the Duerfeldt Lab in the Department of Chemistry and Biochemistry at the University of Oklahoma is published in ACS Med. Chem. Lett. September: Our work on understanding and designing cyclic peptides has been officially funded by the NIH/NIGMS R01 grant! September: Our paper “Predictions for α-helical glycopeptide design from structural bioinformatics analysis” is published in J. Chem. Inf. Model. September: Mr. Eric Chen joins the group. Welcome, Eric! August: Dr. Jiayuan Miao joins the group. Welcome, Jiayuan! 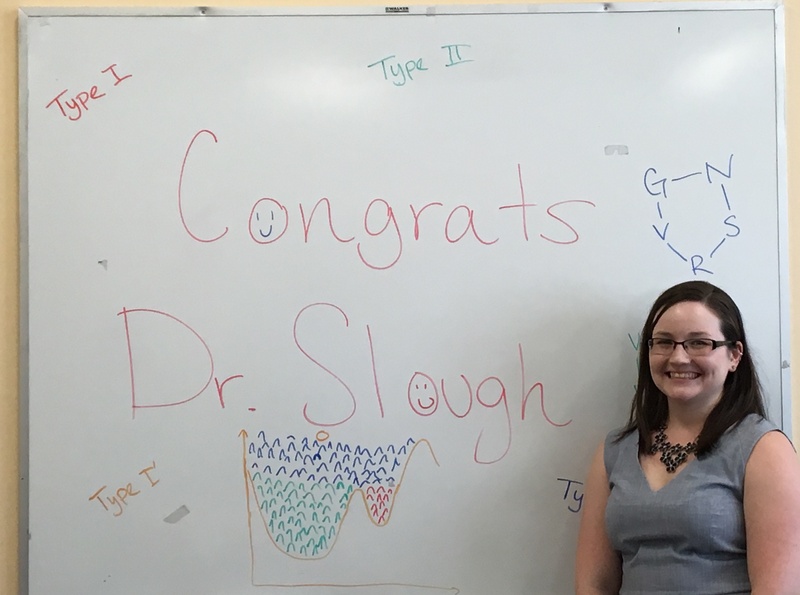 August: Diana Slough defends her PhD thesis. Congratulations, Diana! August: Our paper “Host proteostasis modulates influenza evolution” with the Shoulders Lab at MIT Chemistry is published in eLife. July: Ms. Steph Xu joins the group. Welcome, Steph! May: Our paper “Correlated rotational switching in 2D self-assembled molecular rotor arrays” with the Sykes Lab at Tufts Chemistry is published in Nat. Comm. April: Our paper “Diversity-oriented stapling yields intrinsically cell-penetrant inducers of autophagy” with the Kritzer Lab at Tufts Chemistry is published in J. Am. Chem. Soc. March: Arya Mekkat is selected as a 2017 Summer Scholar. Congratulations, Arya! January: Our paper “Toward accurately modeling N-methylated cyclic peptides” is published in Phys. Chem. Chem. Phys. January: Our paper “Mapping the sequence—structure relationships of simple cyclic hexapeptides” is published in Phys. Chem. Chem. Phys. November: Ms. Mong Mary Touch joins the group. Welcome, Mary! October: Our paper “Consequences of glycine mutations in the fibronectin binding sequence of collagen” with the Brodsky Lab at Tufts Biomedical Engineering is published in J. Biol. Chem. September: Mr. Dan McKeen joins the group. Welcome, Dan! August: Zach Graziano wins the ACS COMP Undergraduate Poster Award at the 252nd American Chemical Society National Meeting in Philadelphia, PA. Congratulations, Zach! August: Our review article “Computational methods to design cyclic peptides” is published in Curr. Opin. Chem. Biol. August: Our paper “D-amino acid scan of two small proteins” with the Pentelute Lab at MIT Chemistry is published in J. Am. Chem. Soc. July: Our paper “Mapping the effect of Gly mutations in collagen on α2β1 integrin binding” with the Brodsky Lab at Tufts Biomedical Engineering is published in J. Biol. Chem. 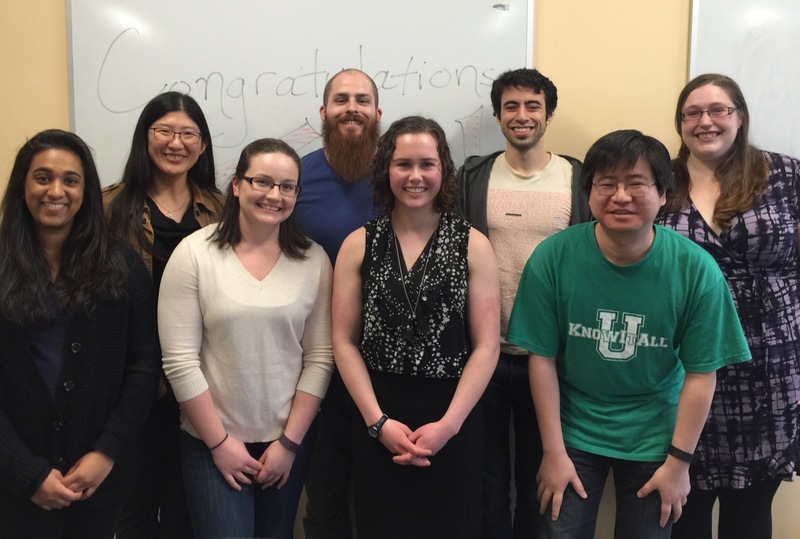 May: The Lin Lab and the Xu Lab in the Department of Biomedical Engineering receive a Tufts Collaborates seed grant! May: Julia Rogers defends her senior thesis. Congratulations, Julia! 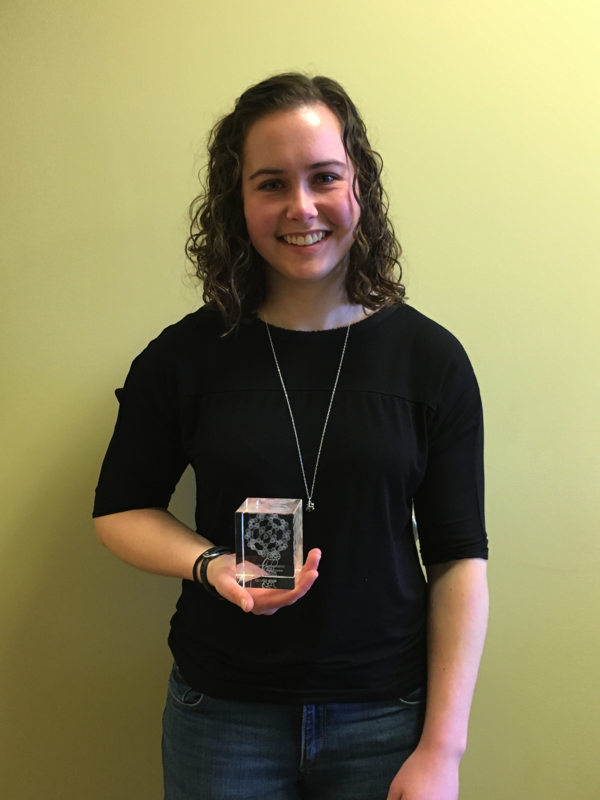 April: Julia Rogers wins the Most Promising Female Scientist Award at the Northeast Student Chemistry Research Conference. Congratulations, Julia! March: Sean, Julia, and Hongtao's paper “Insights into how cyclic peptides switch conformations” is published in J. Chem. Theory Comput. March: Zach Graziano is selected as a 2016 Summer Scholar. Congratulations, Zach! March: Julia Rogers receives the Durkee Scholarship. Congratulations, Julia! February: Group party at Sabur! November: Our review article “Collagen interactions: Drug design and delivery” with the Brodsky Lab at Tufts Biomedical engineering is published in Adv. Drug Deliv. Rev. November: Sarah Solomon passes the Research Topic Exam. Congratulations, Sarah! October: Julia Rogers wins the Outstanding Presentation in Theoretical Biophysics Chemistry at the Gulf Coast Undergraduate Research Symposium. Congratulations, Julia! October: The group participate in the Reverse Science Fair at Medford High School! September: Ms. Arya Mekkat joins the group. Welcome, Arya! August: Julia Rogers wins the ACS COMP Undergraduate Poster Award at the 250th American Chemical Society National Meeting in Boston, MA. Congratulations, Julia! July: YSL receives the ACS OpenEye Outstanding Junior Faculty Award in Computational Chemistry. June: Diana Slough passes the Third-Year Research Update. Congratulations, Diana! June: Sean McHugh passes the Third-Year Research Update. Congratulations, Sean! April: Diana Slough wins the American Institute of Chemistry Student Award. Congratulations, Diana! April: Diana Slough is selected to participate in the Tufts GREAT program. Congratulations, Diana! March: Mr. Zach Graziano joins the group. Welcome, Zach! March: Julia Rogers is named a 2015 Tufts Beckman Scholar. Congratulations, Julia! March: Julia Rogers wins the COMP Division's Undergraduate Research Poster Award at the 249th American Chemical Society National Meeting in Denver, CO. Congratulations, Julia! January: Sean McHugh receives the GAANN fellowship. Congratulations, Sean! December: Hongtao's paper “Toward structure prediction of cyclic peptides” is published in Phys. Chem. Chem. Phys. November: Ms. Diana Gooding and Ms. Sarah Solomon join the group. Welcome, Di and Sarah! 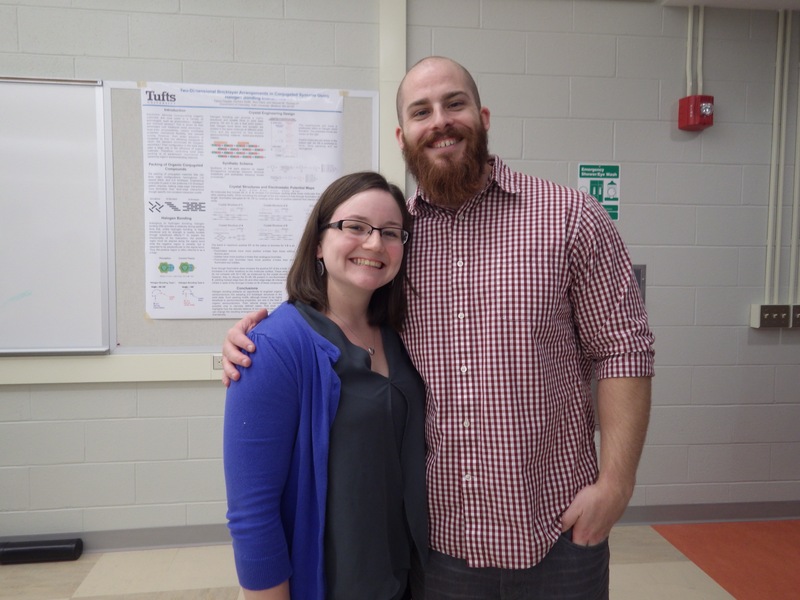 October: Diana and Sean participate in the Reverse Science Fair at Medford High School! October: Our paper “A bicyclic peptide scaffold promotes phosphotyrosine mimicry and cellular uptake” with the Kritzer Lab at Tufts Chemistry is published in Bioorg. Med. Chem. July: YSL presents our work on cyclic peptides at the American Conference on Theoretical Chemistry. Diana, Yu-Shan and Sean at the 2014 ACTC. April: Josh Levy is elected to Phi Beta Kappa, Delta Chapter of Massachusetts at Tufts University. Congratulations, Josh! April: Diana Slough passes the Study Topic Exam. Congratulations, Diana! April: Sean McHugh passes the Study Topic Exam. Congratulations, Sean! April: Josh Levy receives the Victor Prather Prize and the Durkee Scholarship. Congratulations, Josh! January: Diana Slough receives the GAANN fellowship. Congratulations, Diana! January: Ms. Julia Rogers joins the group. Welcome, Julia! January: Our paper “Convergent diversity-oriented side-chain macrocyclization scan for unprotected polypeptides” with the Pentelute Lab at MIT Chemistry is published as a cover article in Org. Biomol. Chem. November: Sean McHugh passes the Research Topic Exam. Congratulations, Sean! November: Diana Slough passes the Research Topic Exam. Congratulations, Diana! October: Mr. Owen Martin and Mr. Jordan Rossen join the group. Welcome, Owen and Jordan! September: Mr. Andrew Rosen joins the group. Welcome, Andrew! April: Our paper “A perfluoroaryl-cysteine SNAr chemistry approach to unprotected peptide stapling” with the Pentelute Lab at MIT Chemistry is published in J. Am. Chem. Soc. January: Mr. Joshua Levy joins the group. Welcome, Josh! November: Mr. Sean McHugh and Ms. Diana Slough join the group. Welcome, Sean and Diana! October: Dr. Hongtao Yu joins the group. Welcome, Hongtao! September: Mr. Benjamin Kim joins the group. Welcome, Ben! September: The YSL Group starts at Tufts Chemistry! § If you find mistakes or broken links, please email Yu-Shan at yu-shan.lin@tufts.edu Thank you! Copyright 2012‒2018 Lin group at Tufts Chemistry. All rights reserved.